FIRST OF ALL WE SELL & SERVICE HAMMOND ORGANS: We stock vintage Hammond Organs and Leslies, and also We have a network of talented and qualified service technicians who can refurbish or rebuild your Vintage Hammond Organ. We can service the Northeastern PA region and also parts of New Jersey. Our technicians are located in Annadale NJ, and Northeastern Pa, we also have a tech near Binghamton New York, We certainly cannot do small service calls if you are a distance from one of our techs. Logistics would make a small service call impossible. However, if you want your organ totaly rebuilt it may be worth using our services we can arrange shipping to get your instrument to us. THIRDLY: We sell a variety of do it yourself service kits and our in house techician can be available to answer questions about products you purchase from us. You can send an email to hammondservice@gmail.com PLEASE NOTE: Before you email, please go to the following link which provides common answers to questions that many people ask about their Hammond organs. Most of your questions will be answered in this link..
FOURTHLY: WE HAVE PARTS FOR VINTAGE HAMMOND ORGANS: We have many items on our shopping cart if you want to save money and do simple repairs on your organ yourself. We have trailer loads of vintage parts, amd even cabinet parts. You can email us for more information. Also go to our on line Shopping Cart to order parts for your Hammond Organ. 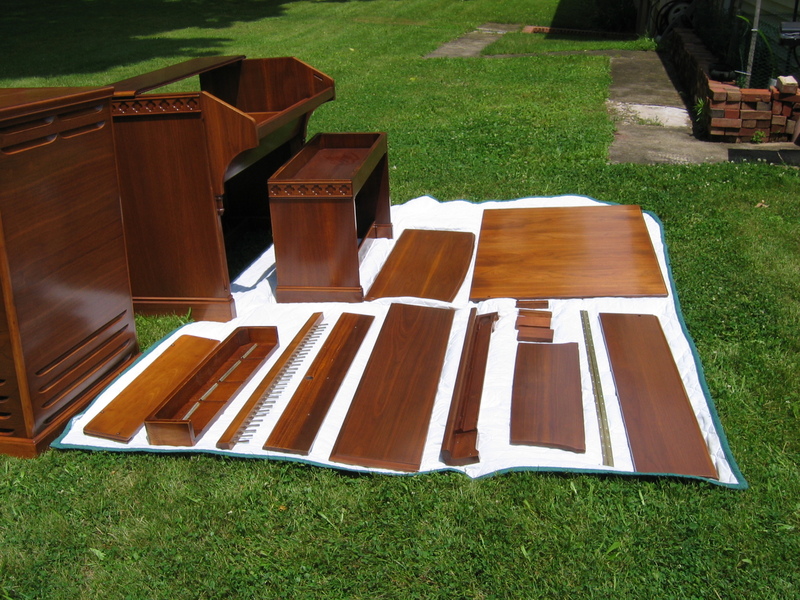 Click here to go to our on line shopping cart to purchase Hammond Organ and Leslie parts. We will be adding more items as time permits and they become available. Paul Studer was trained at the Hammond Factory out of Chicago in the early 1950's. He was assigned to be the main service rep for the entire east coast New York region for Hammond. I don't know a man alive that knows Hammonds better than he does. Paul eventually started his own service company in New Jersey. Paul has been servicing Hammond organs for over 50 years. He has serviced organs for David Letterman Show, Brooklyn Tabernacle Choir, Bruce Springsteen and a host of other studios and churches in the New Jersey New York area. Jason Thompson is an assistant technician who is working along with Paul. He is a musician who loves Hammond Organs and helps in shop work and pick ups and deliveries and also helps us with misc rebuild jobs. My son Joe Bissol working in the refinishing shop on refinishing a vintage B-3. We recently restored two B-3 organs that were totaly submerged in the Wilkes Barre flood. Below is a picture of one of them in our spray booth. Any other organ or piano would be unrestorable. Joe has been working with me on refinishing projects since he was 13 years old. He has been trained by some of the best refinishers in the country. The finish he does on a vintage B-3 is finer than you would have on a new B-3 coming out of Hammond Suzuki. The quality of the wood on a vintage B-3 or C-3 is of the finiest qaulity and worth restoring. There is no way a new organ would be worth restoring after being totally submersed in water like this instrument you see in the pictures below. Almost all Vintage Hammond Organs are at the age where they need service to be put back in proper operation and optimum playing condition. For instance, almost every original Hammond made in 50's and 60's needs new AC power cord replacements. The generator, and line box filters generally leak and need replacing, to get the organ back to proper output levels. Vibrato scanners, often need rebuilding, amps, need rebuilding, bus bars can be lubed or replaced. We often have to fix leslie cables and connections, and switches as well as replace tubes. These are just a few examples of the rebuilding and refurbishing procedures, and checks that we do. All though this may seem like a lot of work, when you compare the cost of a new organ, your overall cost may be less. These rebuilt Hammonds still have plenty of life in them if properly refurbished or rebuilt. How many electronic organs do you know that are still worth playing and listening to that are 50-60 years old? The unique sound of a vintage Hammond never grows old! With proper oiling and care there is no reason why your rebuilt Hammond cannot last another 30 - 40 years.